Select the inner and outer diameter of the tube you require to display the cost per 2m length. These items can be ordered online, but cannot be shipped. They must be collected from our Head Office. 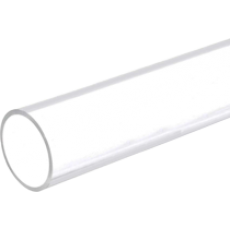 Clear acrylic tubes are sold in 2 metre lengths and a variety of Outer and Inner Diameters. Due to the dimensions and nature of this product, we are unable to sell online. These products can be purchased directly from our head office. Please contact us on the number above for more information. Acrylic / Perspex Tube can be used for a wide range of applications from Light Tubes and Enclosures for LED and Electronic equipment to a wide range of Point of Sale and Acrylic Displays, as well as Art, Sculpture, Signage, and much more. Acrylic / Perspex Tube can be turned, milled, drilled, sanded, polished and heat formed into just about any shape desired with the use of appropriate equipment. Prices are shown in Australian Dollars including GST. Shipping costs will be calculated for you at the Checkout.